Dr. Samuel Kramer, D.C. graduated from Life University of Chiropractic. He has worked in many types of practices, such as Sports Chiropractic and Wellness Care Clinics. His specialties include Exercise Rehabilitation, Nutrition Counseling and Wellness Care. Dr. Kramer is also Member of The American Chiropractic Association. As of January 2016, Dr. Kramer became owner of Bergman Chiropractic LLC. He currently resides in Bucks County. Frank Bergman D.C., F.A.C.O. was born in New York and completed his Bachelor's Degree in Biology at St. John's University. He went on to study Chiropractic at Columbia Institute of Chiropractic(New York College of Chiropractic) and earned his Doctorate in 1976. He moved to Levittown in 1977 and opened his practice at it's present location in the Stonybrook section of Levittown. 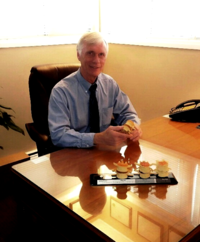 He continued his studies in Chiropractic Orthopedics and became a Diplomate in Chiropractic Orthopedics in 1988. Several years later he received his Fellowship in the American College of Chiropractic Orthopedics. Dr. Bergman served as President of the Pennsylvania Academy of Chiropractic Physicians as well as being a past President of the Bucks County Chiropractic Society. He is a current member of the Council on Chiropractic Orthopedics; American Board of Chiropractic Orthopedics; and the American Chiropractic Association. Bob Danley has been a massage therapist since 2001 and became nationally certified in 2008. Bob practices Deep Tissue and Therapeutic massage. He specializes in targeted massage that works in conjunction with your chiropractic care.